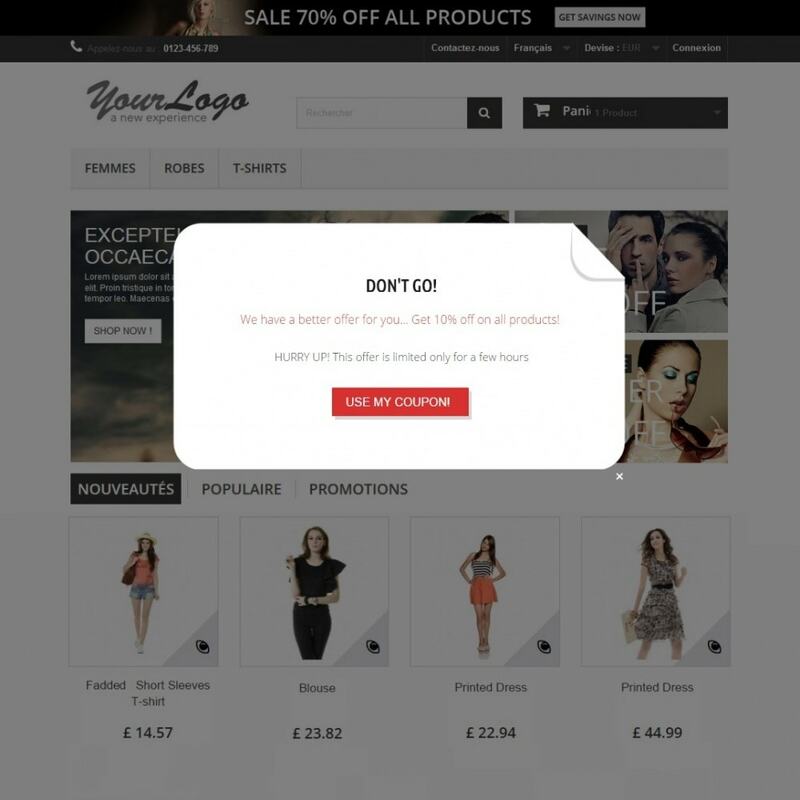 Make a pop-up appear when your visitors are about to leave your site, and encourage them to complete their order! 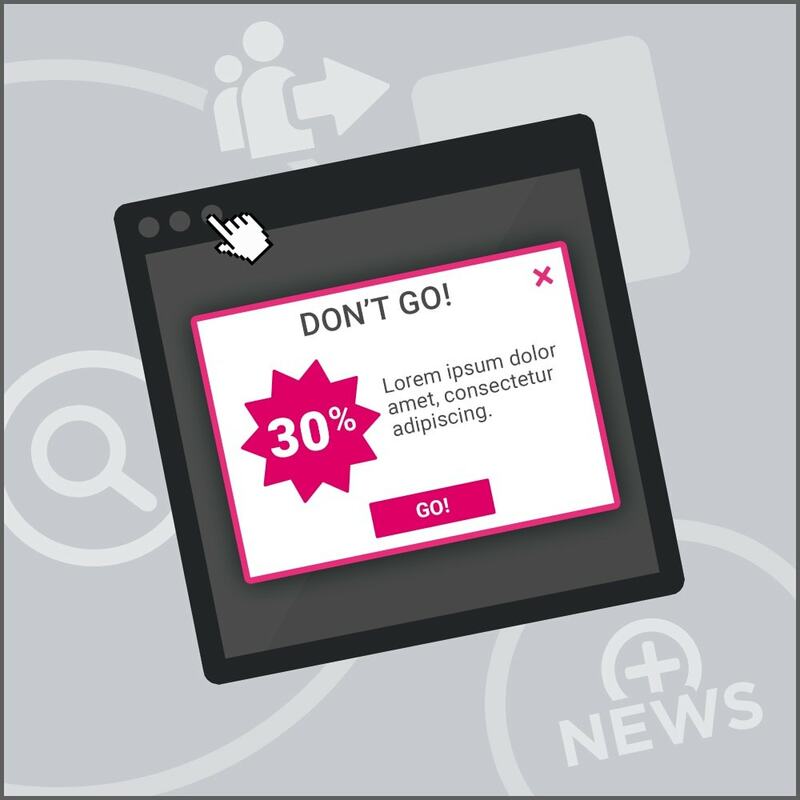 Thanks to the Pop Exit module, win back 25% of visitors who are about to leave by offering them a very appealing temporary (or permanent) reduction. 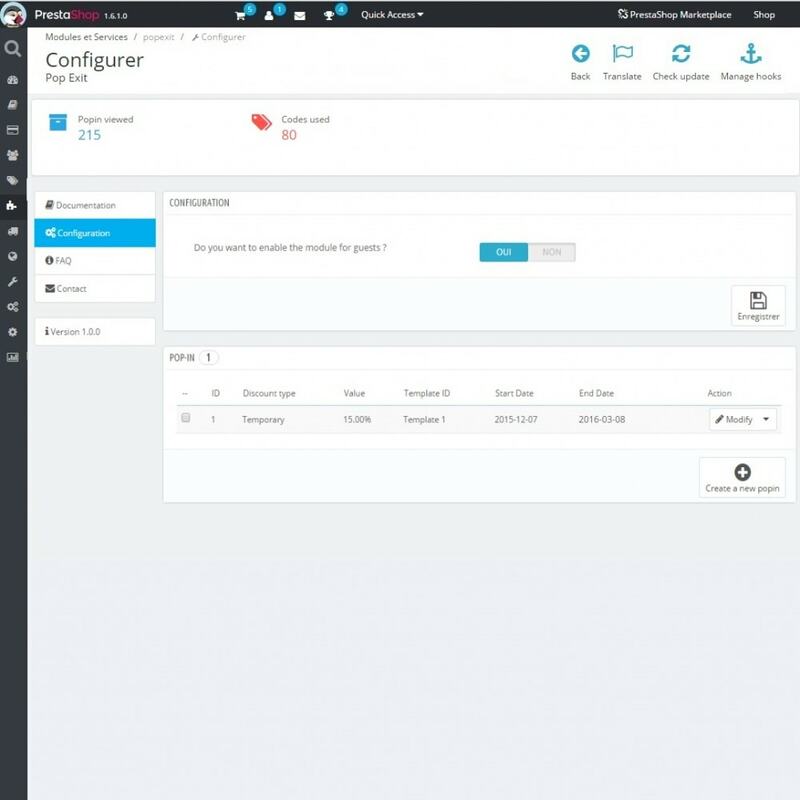 using the professional designs available to you and the easy-to-configure module. 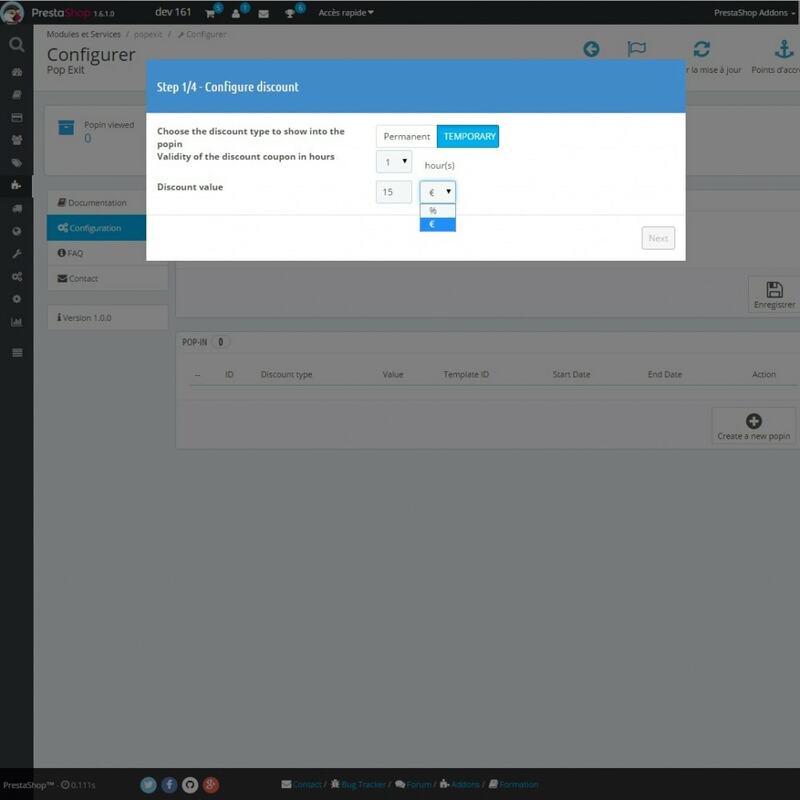 No HTML knowledge required: Easily configure Pop Exit in less than 5 minutes! 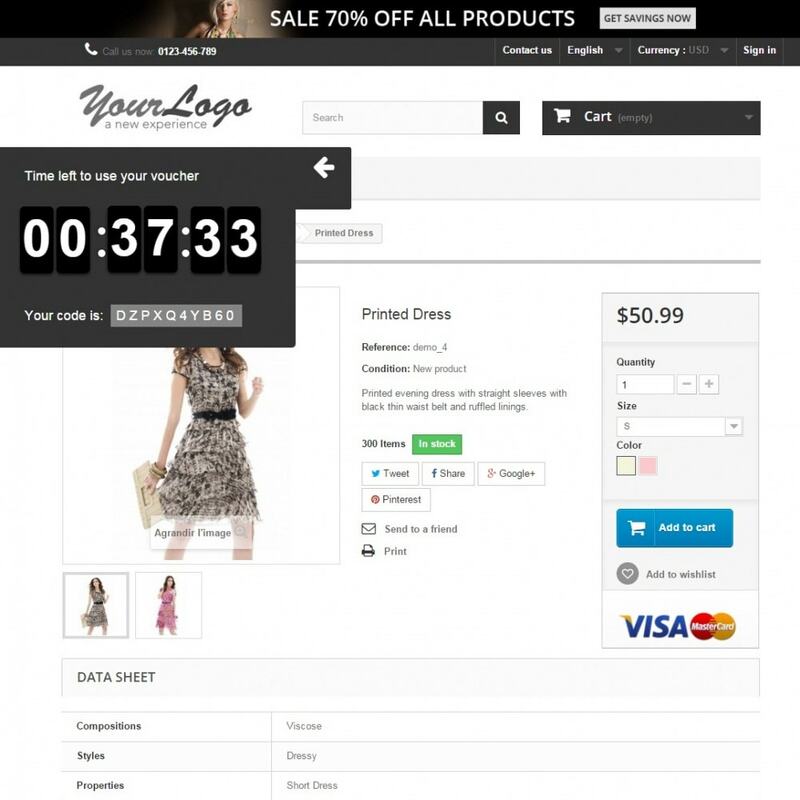 Professional design: the themes provided were created by PrestaShop Designers in order to offer you the best quality. Just choose your favorite! 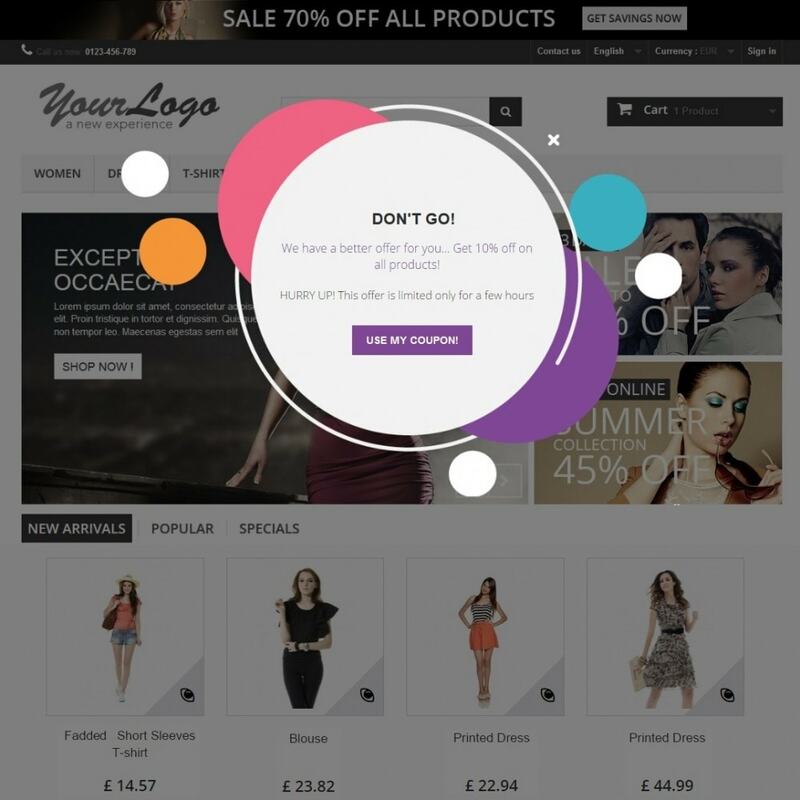 'Exit Detection' / 'Exit Intent': the pop-up only appears at the moment when customers are about to leave the store, when they move the mouse to their browser's address bar, thus preventing them from leaving the website immediately. Insert a text that sets out legal notices and terms and conditions for the promotion. 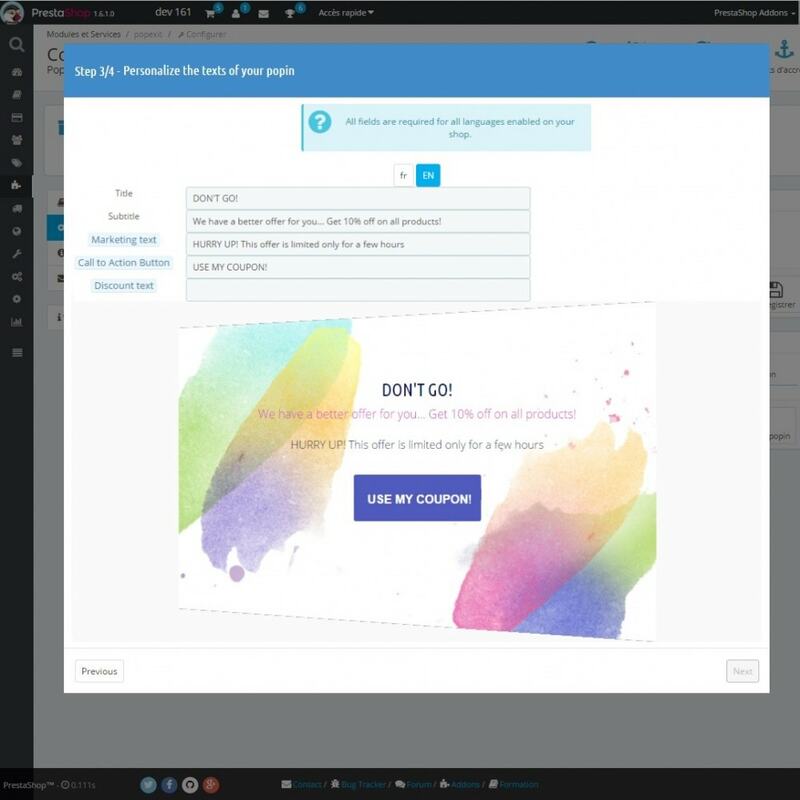 Similar to pop-ups, but offering an improved user experience, pop-ins blend seamlessly into the page where they are displayed. Easily close the modal window by clicking outside of the pop-in or by clicking on the cross in the corner. Suited to all types of stores, no knowledge of programming or graphic design is needed. Due to the "Exit Detection" / "Exit Intent" technology that tracks the mouse movement on the browser's address bar, this module only works on computers, it is not compatible with tablets and smartphones. Мы приглашаем вас быстро увеличить средне-покупательную способность корзины ваших клиентов, благодаря специальной акции прекрасно адаптированной для покупательной способности ваших клиентов. With the Online Chat module developed by PrestaShop, you can finally offer an online chat system on your shop to have discussions with your customers. This communication tool has become vital for e-commerce stores and allows you to create stronger relationships with your customers by guiding and advising them in their purchases in real time. 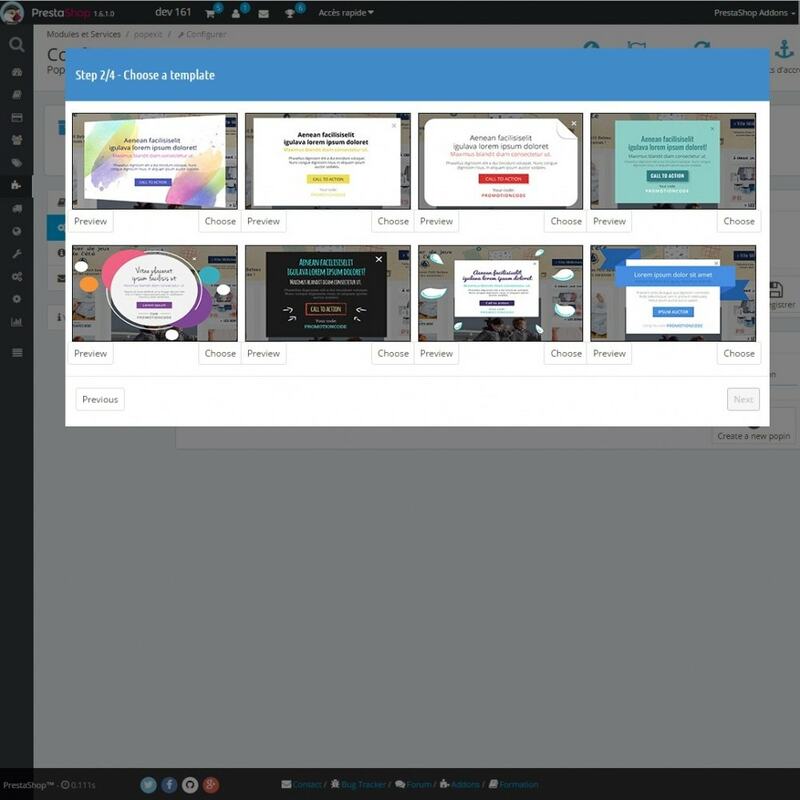 With this module that requires no subscription, improve your customer relations and your after-sales services, while increasing your conversion rate by up to 40%! 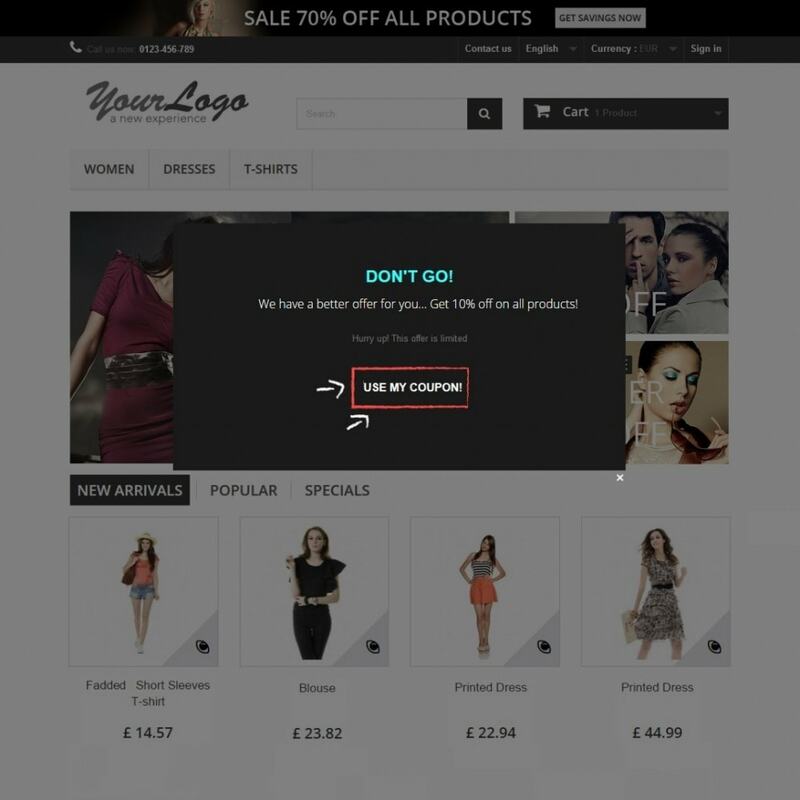 Make a pop-up appear when your visitors are about to leave your site, and encourage them to complete their order! Thanks to the Pop Exit module, win back 25% of visitors who are about to leave by offering them a very appealing temporary (or permanent) reduction. The technology built in to the pop-up is not intrusive or annoying, offering your customers the optimum purchasing experience.